Born in New York, New York, in 1943. Education: Chouinard Art School, Los Angeles, California, 1962-66 Elsa Rady is known for her simple porcelain yet elegant vessels primarily making vases, bottles and bowls. 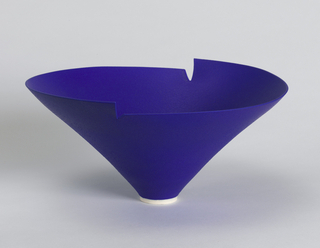 Many of her bowl feature diagonal cuts along the rim, to visually create the feeling of centripetal motion. 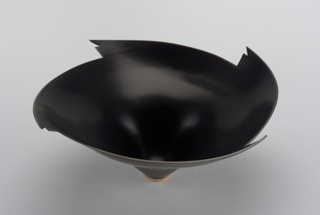 Rady used her work to reinterpret ancient classical ceramic forms and techniques, particularly those derived from Asian ceramic traditions. The simplicity and clean lines of her work also reflect mid-century modern aesthetics. She challenged the existing standards for ceramic display by creating custom wall-mounted shelves and suspending her works from stainless steel cords. Rady... more. We have 2 objects that Elsa Rady has been involved with.